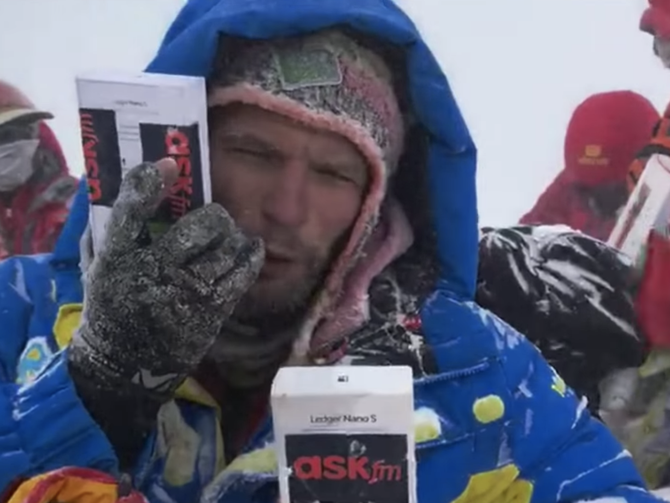 A new altcoin called ASKfm decided to promote the idea of going to the moon by sending a team of to the top of mount Everest with Nano Ledger Wallets containing large amounts of the ASKfm currency. In total a wallet with 500k of ASKfm was buried on top of the summit of Everest. In an unconventional way to launch the token sale, ASKfm builds their communication upon the idea of an ascending trend. That’s a pun, of course, but also a leadership claim. While others try sophisticated marketing techniques, these guys went out there and put themselves right on top of the highest mountain on the planet. An elegant way to boast ideological superiority to every other crypto. A way quite strangely unexplored before. Even memes-wise, think about the closest starting point to reach the moon. It seems so obvious, yet no one has done it. The press release mentions some challenges but does not mention other problems. The most negative mentioning the challenges of the teams descent. Of course, there were issues. While descending, two of the guys were stuck at above 7,000 metres with no reserve oxygen for the entire period and were unable to continue due to the extreme weather and health conditions. Air rescue responded on the second day, they’re both safe and currently receiving treatment. However, as many people know climbing mountains, any mountain is dangerous. This is also of true of course of Mt Everest. There are more dangerous mountains but the world's highest mountain is still very dangerous especially for a marketing promotional stunt. Facts have come out that the team indeed experience far more tragedy during the promotion than was initially reported in the initial press release. One of the climbers on the ASKfm suffered from frost bite on his fingers and toes and even more tragic one of the Sherpas that was working for the team did not return to base camp and is assumed to be dead. In a Coinnuts post by the Bitcoinist the author makes the point of saying no one is to blame for the dead and that these mountain climbs are inherently dangerous. Many of the mountaineering posts are critical of ASKfm for using a mountain as a stunt. They are also critical of ASKfm seemingly glossing over the disapearance of the sherpa. The Coinuts article and the Outside Online article also point out that the team did stop on their descent to help out a Chinese climber named Saber Liu who was on the mountain alone and did not have oxygen. Some of the posts definitely had hints of disdain at the overall crypto market. My opinion is between that of the more critical posts and the posts in their defense. Climbing mountains is complicated and dangerous and tragic events like this do occur. However, as a Coloradan I have seen many people come to our (Much smaller mountains) and treat them like Disneyland rides, they are not and they deserve far more respect. Is treating mountains like gimmicks really good for a brand? For all of the promotion on this I still have no idea what sets ASKfm apart from other cryptocurrencys beyond the fact they like to take risks. I'm not going to fully condemn them, but I also would not recommend this type of marketing in the future.